Here are some images of some of our fabric designs based on twills on 4 or 8 shaft looms. As you can see we enjoy using drill or damask threadings as well as 3/1 interrupted twills with colour and weave effects. 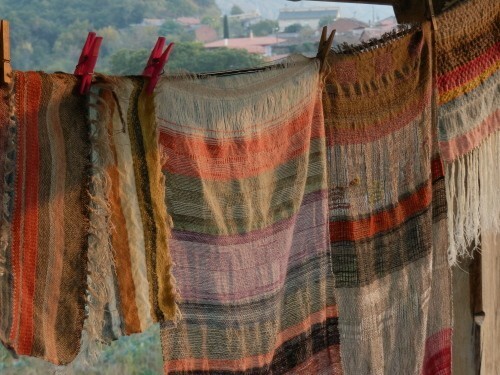 Anna Champeney offers residential one-to-one tuition for intermediate and beginner level weavers and courses in textile drafting for beginners at her home in the idyllic Ribeira Sacra, northwest Spain. Louet table loom: Looms like this require a minimum of 24 – 35 hours tuition to enable you to set it up and weave simple fabrics. Having a floor loom without knowing how to use it is a bit like having a small plane without knowing how to fly it! My reader goes on to ask me for advice, and I replied as I always do to this kind of inquiry. 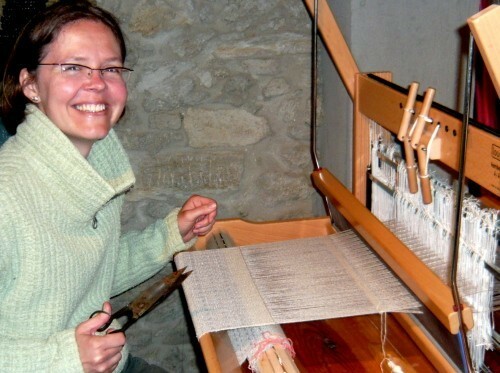 I don´t advise anyone to buy a loom (unless it´s a rigid heddle loom) without doing a course first! Buying a loom and the other necessary equipment can be costly so it is best to learn first and know that you´re going to enjoy weaving. Speaking personally I have invested almost every year since I began weaving in 2000 in improving my weaving and designing skills. I have travelled 12 hours to do a course in Barcelona and travelled to the UK, and, where necessary, paid for one-to-one tuition in particular areas, learning with professionals such as master weaver Lotte Dalgaard. I think it´s really important, as a beginner, to have a good first experience of weaving – with a properly trained teacher. Weaving is far more versatile than crochet or knitting and you can make anything from gossamer light linen for light headscarves to heavier fabrics for upholstery or rugs. There are so many techniques to learn that you will never exhaust your curiosity to learn more. Of course there ARE books for beginner weavers, although I still think any new weaver will get more out of them after doing a beginners´ course. So, for my Chilean reader, here´s a couple of recommendations…. If you read English then I would recommend all the weaving books by Peggy Osterkamp. She is the best author I know for explaining technical information in a simple and easy-to-understand way. She even has a d.v.d. now, which could be well worth trying as an alternative to a book. But expect to spend several days in total on your first weave project. It´s not something you can master in an afternoon. In Castillian Spanish there is very little literature about loom weaving. But you do have one that is pretty comprehensive and what´s more, you can download it free. Neither of the books I´ve recommended are that inspiring visually – it´s not their objective (Ninette Frederiksen´s book was written in the 1980s and stylistically it shows. But they are meant to teach you the technical side of weaving – how your loom works and how to put the yarns onto it so you can weave them. I have not seen Peggy Ostercamp´s video but on the strength of her books I would think it would be worth trying. Fabric samples made by a group of pupils on a 5-day linen weaving course for beginners which I usually organise annually from my studio in the picturesque village where I live in the mountains of north Spain. My recommendation for beginners is that they opt for 24 – 35 hours tuition to learn just the basics of setting up the loom and weaving basic fabrics on it. 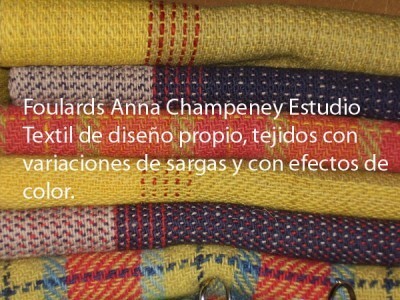 The courses run at my studio, Anna Champeney Estudio Textil in north Spain, for example, are intensive and last 3 – 5 days (see the section of the textiles naturales blog for next course dates). A course enables the beginner weaver to set up their loom and weave simply fabric. And yes, after this it is possible to take a table loom home with you after the course, and and start weaving simple fabrics on your own at home, because several pupils have done this…. and are still weaving years later! Knowing how the loom works and how to set it up is one thing. But I guess, like my blog reader in Latin America, you want to weave not because you´re passionate about becoming a weave technician but because you want to create beautiful woven cloth. The simplest of fabrics can be very beautiful. Plainweave is the simplest weave that all beginners learn and which is woven 80% of the time by industry. It is also extremely versatile. So you can weave fabrics knowing just the basics. When you want to progress and design something more complex or original you will need to think about learning some weave theory. 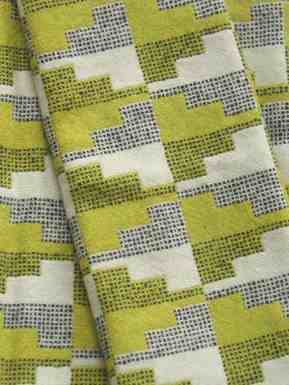 To design complex, original fabrics l ike this one, by Eleanor Pritchard (UK) requires professional level training including weave theory and design skills. Weave theory starts with understanding more about the structures of woven cloth and how they can be represented on paper. Most weave books cover the basics. 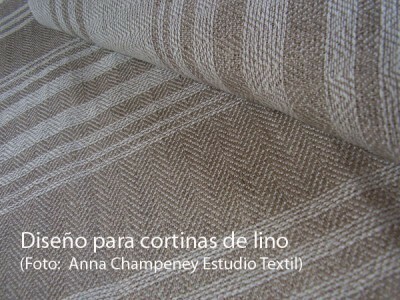 At Anna Champeney Estudio Textil we offer a 2-day weekend course with excercises that you can practice with. Weave theory allows you to understand more about how woven cloth is made instead of simply following formulas blindly. Even if you don´t want to go on to design your own original woven fabrics you will find that a basic understanding of the graphic representation of weave enables you to use pattern books and weave magazines such as Handwoven, to try out more complex patterns. In English there are some excellent books for understanding about weave theory and design. Ann Sutton´s excellent book “The Structure of Weaving” and ” Mastering Weave Structures” by Sharon Alderman. However you decide to learn to weave I wish you the best of luck and hope you´ll enjoy weaving beautiful fabrics for years to come. Hoy os pongo este mensaje que recibí hoy de una mujer chilena que tiene muchas ganas para aprender a tejer en telar…. No me sorprende que está con dificultades !Es un poco como tener un coche o avioneta … pero sin recibir formación de piloto! Me pide consejos para aprender a tejer en telar de bajo lizo a base de libros. Le he respondido como siempre en casos parecidos; no aconsejo a nadie intentar a tejer en telares (excepto telares muy sencillos, como los telares llamados rígidos) de bajo lizo sin realizar un curso presencial con alguien experimentado. 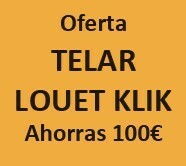 Y más, es recomendable realizar un curso antes de invertir lo que puede ser bastante dinero en la compra de un telar. Hablando personalmente he invertido en cursos de formación cada año, desde que empecé a tejer en el año 2000. 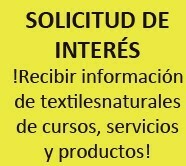 He asistido en cursos de principiante, cursos monográficos, cursos teóricos y cursos de diseño. Creo que para aprender la técnica básica, ganas muchísimo aprendiendo directamente de alguien, porque te ahorrarás muchos líos y no te desanimarás. El tejido en telar de bajo lizo es una actividad creativa realmente fantástica y mucho más versátil que el ganchillo o tejido con agujas. 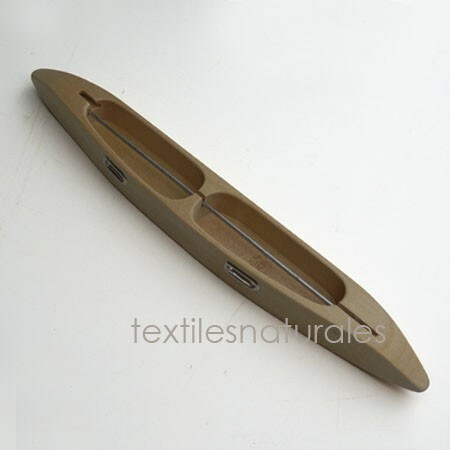 Puedes tejer desde tejidos superfinos hasta alfombras gruesas, cortinas de lino o tejidos clásicos de pata de gallo, para chaquetas o abrigos. Pero no es nada obvio como usar la máquina de tejer y hace falta prepararlo bien con los hilos. Piénsalo así – si realmente fuera tan fácil, habría un montón de revistas a la venta con proyectos para tejer en telar. Pues, no he visto ninguna revista en librerías dedicado al tejido en telar. Por algó será…..
Para mi lectora chilena, voy a hablar de los mejores libros que conozco para tejer. Si sabes entender el inglés, pues, tienes un montón de literatura sobre el tema. La autora preferida mía sobre temas técnicos de tejer en telar es Peggy Osterkamp y tiene una gama de libros y incluso un dvd para principiantes. Realmente tiene un talento especial en explicar – y simplificar – el tema. Los dibujos en sus libros son excelentes y puede ser que compensa comprar algún libro suyo simplemente por los dibujos. Sigo diciendo, no obstante, que un libro para principiantes te ayudará más una vez que has realizado un curso básico. No conozco personalmente el d.v.d. pero podría ser también una buena manera para aprender. 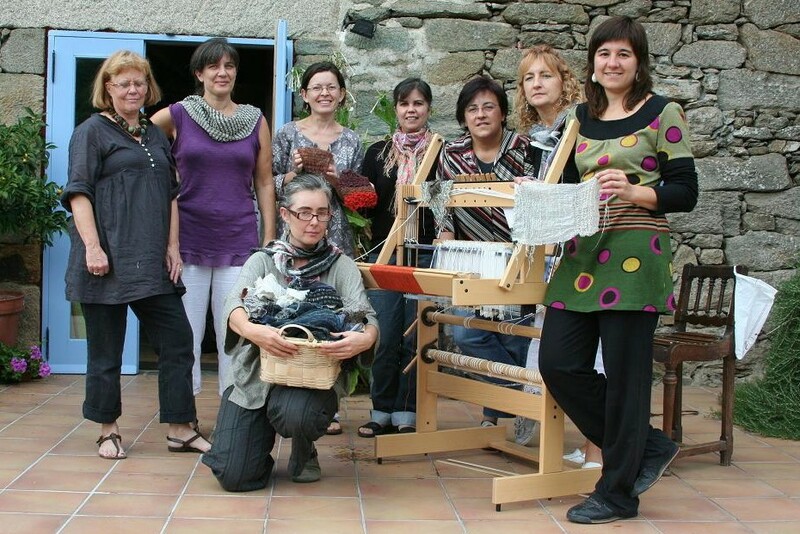 Fabrics made by a group of pupils on a 5-day linen weaving course for beginners at Anna Champeney Estudio Textil in the mountains of north Spain. Good luck, and keep a look out for our weave courses for beginners and for those with more experience. We offer intensive courses and one-to-one tuition. The simplest of looms can produce sophisticated and fun results with a bit of imagination and daring, as Spanish Fine Art and Fashion students demonstrated in a recent Creatividad (creativity) workshop aimed at fusing the worlds of fashion and craft. Spanish fashion designer brand American Perez teamed up with profesional weaver and textile artist, Anna Champeney, to lead students in an intensive workshop in which each student had to develop their own methodology, design and realise a weave project from start to finish, in just three days. The workshop reflects the typically innovative approach to fine art and design education adopted by ESDEMGA which focuses on creative and experimental processes. The creative partnerships between profesional Spanish craftspeople and fashion designers were formed to enable students to experience the different approaches taken by each sector to design and making as well as to discover a hands-on, process-based approach to design which encourages a greater sensitivity to textures and fabrics. Looms similar to this one – measuring about 20 x 8cm – were common in Galicia, north Spain. They were used to weave narrow bands of woven cloth with fringes and tassles which were then sewn onto the heavy, hand-woven folk coverlets as an extra flourish in the overall design. Yarn wrapping and macrame techniques were also applied to the fringes to achieve different effects. The ESDEMGA fashion and art students didn´t confine them to traditional linen and wool yarns, as the folk weavers did, however. The brief, presented by Anna Champeney, at the beginning of the creative workshop, was to develop a metholodogy from scratch, using any and every material and yarn which could be used. As such students used copper wire, wools and linens, strips of recycled cloth, and even 3-d objects and short lengths of willow (more commonly used in basketry not loom weaving) to weave with. Narrow bands of woven fabric were combined and sewn together to make larger scale fabrics or 3-d objects such as bags. Congratulations to all the workshop students who worked so hard during the project: Raquel Álvarez González, Marta González Fortes, Cintia Roberta Cuesta, Maria José Rodríguez Garcia, yeray Suárez Arenas, Pilar Ullod Rivera, Cristina Varela Casal, Maribel, Andrea y Carla. All the pieces in the gallery below were made on the small fringe loom, as in the photo above. Just to let you know that our traditional Galician linen bags with lemon verbena grown here by us are now in stock again. See the shop for more details.